A biographical drama, Beautiful Boy descends into the abyss of damage caused by drug addiction. 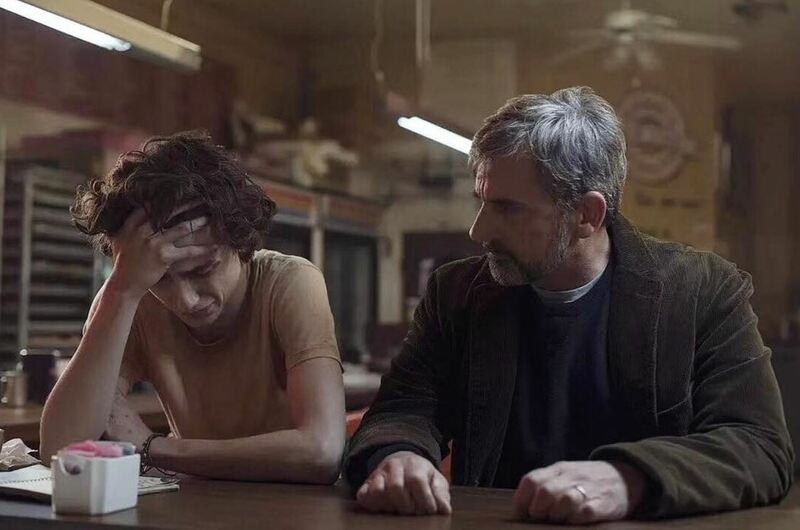 Writer David Sheff (Steve Carell) is investigating crystal meth, because his teenaged son Nic (Timothée Chalamet) is hopelessly addicted. In flashbacks, their history is revealed. David divorced Nic's mother Vicki (Amy Ryan) and remarried Karen (Maura Tierney), and as a young kid Nic was shuttled back and forth between parents. He also felt he never measured up to his father's expectations, despite David's attempts to be a loving and supportive parent. Nevertheless Nic was a star student, a budding writer and had his pick of colleges, but his drug use starting with marijuana and graduating to harder drugs rendered him aimless. A stint in rehab did not help and was followed by an attempt at college life that only exposed Nic to more drug use. Vicki tries her hand at helping her son, and for a while his prospects improve but more trouble lies ahead for the exasperated father and damaged son. Based on a true story, Beautiful Boy is directed by Felix Van Groeningen and adapted from the two books by David and Nic Sheff. The film is an unyielding journey into the agony of addiction, and while there is plenty of genuine and heart-warming affection on display between father and son, the overall mood is one of despair. Controlled by the iron grip of drugs, Nic pushes ever harder into self-destructive behaviour and David runs out of options on how to help, creating a bleak emotional trajectory. Despite all the grief and desperation, the film remains non-judgemental in tone, recounting a family's trauma without lecturing. Nic's bad decisions receive a light touch and he is otherwise portrayed as a victim. David is never less than well meaning, his flashes of rage generated by frustration and disappointment, mostly directed at himself for being unable to come up with answers and solutions to his son's nightmare. The film demands strong navigators through all the darkness, and the two lead performances deliver. Steve Carell is the entry point into the world of anguished parenthood, and he conveys the range of reactions from anger to despondency, passing through a willingness to try almost anything to help. 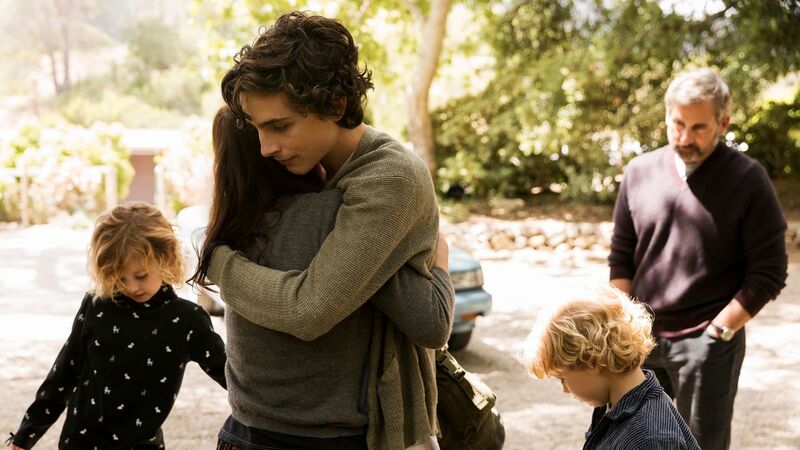 Timothée Chalamet is heartbreaking as the teenager at the mercy of a brain craving ever higher doses of crystal meth, the interludes of normalcy adding poignancy to his next chapter of surrender to substance abuse. The film is overlong at 120 minutes, and Nic's repetitive ups and downs threaten to meld into each other. As well, large parts Beautiful Boy unfold in flashback, and Van Groeningen overplays his hand in assembling the film's structure. Many stretches have successive scenes that jump all over the timeline from the present to various points in the past, as if intent on undermining cohesion and shaking off sustained interest. Despite the choppiness, the strength of the material is undeniable. Beautiful Boy registers a forceful impact through a candid portrayal of a once promising life wasting away.